This photo, taken from Mount Wilson, shows light pollution over downtown Los Angeles. After spending years wowing the astronomy world with gorgeous time-lapse views of the stars, two astrophotographers have teamed up for a new project: raising awareness of light pollution. Gavin Heffernan and Harun Mehmedinovic hope to raise $70,000 via a Kickstarter crowdfunding campaign to create an astrophotography book and a video time-lapse series showing dark skies in the United States and Canada. The project, which closes Sunday (May 10), is called SKYGLOW, a term referring to the brightening caused by light pollution. You can see a video of how SKYGLOW will work here. 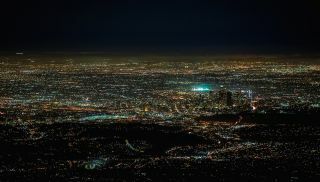 Heffernan, who lives in Southern California, said that the lights of Los Angeles clearly show up in time exposure pictures taken from 150 miles (240 kilometers) away. He said the need to avoid such light-polluted areas sparked a discussion that led to SKYGLOW. Most of the money raised during the Kickstarter campaign will go to printing and shipping the books to an estimated 3,000 people, with the remainder budgeted for a trip through the United States and Canada to take pictures from various spots, including dark-sky preserves. With $55,000 raised as of Thursday (May 7), the project may not end up being funded, Mehmedinovic acknowledged. However, the founders said the effort will at least raise awareness about the effects of light pollution, which not only hinders skywatching but has also been traced to changes in animal activity. Galactic star trails spin over the Los Angeles County Museum of Art (LACMA) in 2015. "Even if we don't succeed," Mehmedinovic said, "we still have something because of awareness of the issue. We have appealed directly to the people and not some middle person." A typical shoot will require five to seven cameras between the two photographers, a number called for due to the quantity of pictures taken. According to Mehmedinovic, a time lapse of just 10 to 20 seconds incorporates 250 to 450 images. A time-lapse project can easily fill up a 4-terabyte hard drive, enough space for a typical consumer to store hundreds of movies. Once the images are taken, they have to be processed and then exported through more software before being uploaded to the Web. "It's a very time-consuming process that eats up [hard-drive] space at an incredible rate," Mehmedinovic said. You can view the Kickstarter campaign at http://www.skyglowproject.com. More information on the project is available at http://www.sunchaserpictures.com/ and http://www.bloodhoney.com/, the personal websites of Heffernan and Mehmedinovic, respectively.